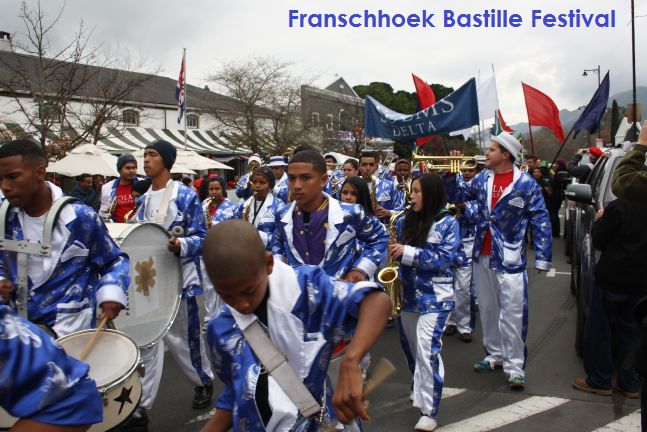 One of South Africa's most picturesque and glamorous towns, Franschhoek will be hosting the annual Bastille Festival on the 12th and 13th of July 2014. The "Champagne" or Cap Classique and Wine region of South Africa will once again celebrate its French Huguenot heritage with a feast of wine, food and entertainment. The Food and Wine Marquee is where most of the fun will be going down. People can come and taste some of the finest French cheeses and Franschhoek wines at the marquee as well as some great food made by great local chefs who will be strutting their stuff. There are loads of activities over the weekend to join in on. Fitness junkies can brace the cold and run in the Salomon Bastille Day Trail Run on Saturday morning or ride in the Bastille Mountain Bike Classic on the Sunday. The town will be abuzz with activities the most popular of which will be the Franschhoek Boules Tournament, the Solms-Delta Parade and the Barrel-Rolling Competition. The Farmers Market will feature performing musicians and carnival dancers, entertainment for the whole family. Tickets for the Food and Wine Marquee cost R200 per person on the Saturday and R150 per person on the Sunday. Families and visitors seeking a more relaxed atmosphere should buy tickets for the Sunday because the atmosphere on the Sunday is traditionally more relaxed. This festival promises to be a very eloquent affair where you can rub shoulders with the wine and food socialites of Franschhoek and Stellenbosch, it certainly is the place to be seen this winter. Our Survey was done on flights from Johannesburg to Cape Town with Mango proving to have the cheapest flight at R872*. These flights all depart on the 11th of July 2014 between 16h00 and 19h35. Travellers should book as soon as possible to avoid disappointment as tickets are limited on this date. This survey compares one-way flight prices from JNB - CPT (You can read more about the airlines that operate on this route by clicking here) on Friday the 11th of July 2014, leaving Johannesburg after 16h00 but before 19h35. For more information on bus/train/car hire over the same weekend click here. *Please note that these prices are subject to change and that they are not guaranteed by us*.